Why is The Grow With Guidance® System better than the others? Why is Grow With Guidance® so valuable? How does the Grow With Guidance® System measure results? 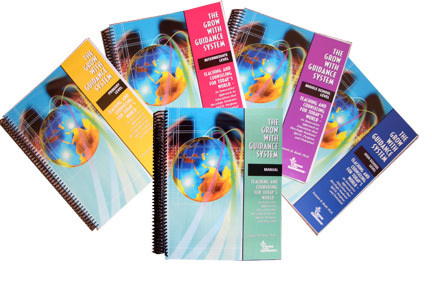 Can I start using The Grow With Guidance® System in the middle school if it’s not used in the elementary levels? Do I need Grow With Guidance® System training to do this? Is there training to have Grow With Guidance® System certification? This System is not a band-aid approach to significant needs. This comprehensive System directly meets the challenges we face with formulas for success. The system is research-and-evidence-based and meets most national, state, and local standards. The System includes everything to implement your 3-to-5-year guidance strategic plan and program. No reordering is necessary after you have a complete set. See the Funding Sources Page for funding ideas. Grow With Guidance® qualifies for School-To-Career and Drug Free Schools and many other funds. This System is an investment in your future. All the standards, benchmarks, indicators, and performance observation/evaluation strategies are provided. All evaluations and forms are included. This is the only program that includes two diagnostic instruments, the CANA and ITS, which also give you evaluation information. Our computer scoring and Report Service can save time and makes generating the diagnostic information from these instruments a snap. The System includes the Florida Key, an instrument that assesses student self-concept-as-learner. YES. You may begin using Grow With Guidance® at any level. The program is developed to be used without training. We provide program support and are available to answer questions. Phone consultation and training can be arranged. Our goal is to support your success. Not at this time. Notify us and we will contact you when we offer special training. Yes. Contact Grow With Guidance® to schedule training tailored to meet your district priorities and needs. Please view the shipping policies here.